This entry was posted in Simplicity, Struggle, Victory! and tagged advice, appreciation, balance, busy, choice, commitment, decisions, deliberate, depression, discipline, focus, fuse, heaven, important, intentional, listen, maintain, motivation, opportunity, overload, prioritize, process, read, refuse, relax, rest, scripture, significant, simple, simplicity, simplify, small steps, spiritual, struggle, time, trapped, unique, value, victory, words, work by admin. Bookmark the permalink. So true Kari. The soul yearns for a simpler life with less to do's so to speak. I balance myself out like this for example. Yesterday was sunny and in the upper 60's. I spent about 6 hours working outside of my home, Cleaning the siding of the house with a scrub brush, cleaning the windows, and installing gutter guards on my rain gutters to keep the leaves out. Doing this now while I have the time will free me later for more rest and relaxation. Also today I will take it easy because of all the physical activity from yesterday. You hit on a key when you plan rest and relaxation after physically demanding work. People often just live day-to-day and forget the benefit of planning (at least a week ahead) when it comes to pursuing simplicity. Great example! I think this is an area that needs to be talked about. We let our lives get really crowded and busy. 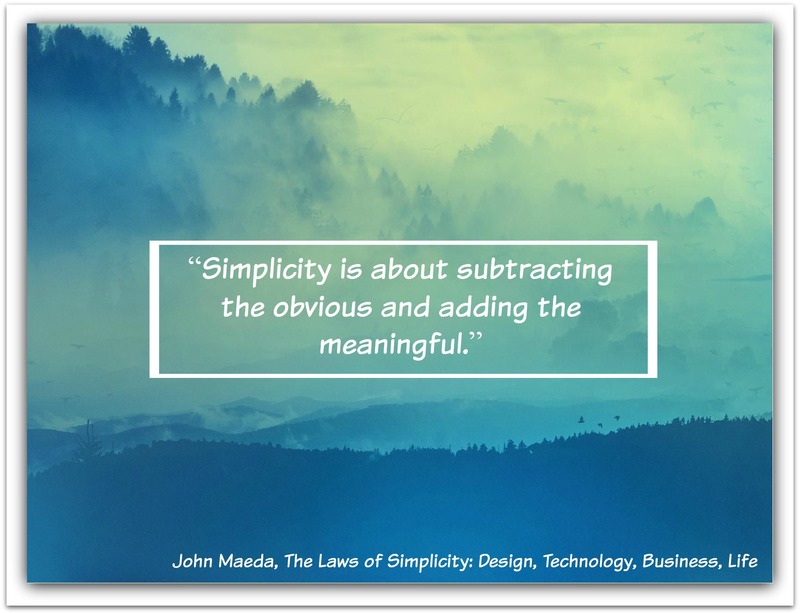 The problem I see is that people then pursue simplicity – but pursue it for the wrong reasons. It almost becomes another form of legalism. I think, like you've laid out here, that we really have to understand the philosophy behind what we do rather than just jumping to the simplifying part. This will be a pretty interesting series! You're right, people often pursue simplicity for the wrong reasons and really end up making life more complicated. Making excuses for why they can't simplify is also common. This is a very personal topic for me, and I am both excited and aprehensive with pursuing it. I think the aprehension has to do with the realization that complexity is pursuing us as much as simplicity, and I see that battle everywhere I look. Part of building simplicity is deciding on focus too. For us, relationship is key. We build our lives around the relationships that are the most important to us. Nothing else will matter if relationships aren't strong. I plan to revisit this topic of simplicity as it is one that many people are expressing an interest in reading more about. About the two sports at once, we have made a decision to not do that. With two kids already each in a sport PLUS vision therapy for one and other school/church acitivities here and there, we just decided another commitment would be too much and decided against one for this spring. Plus, and this comes back to what I said in the beginning of this reply, our relationships would start to suffer if we added something else to our schedule. That is the approach we've chosen to follow. I have often said, "I am a simple man. I like simple things. Keep things simple and you got me." Complexity is dangerous to me. I think we have added way too many extras in our lives. Even though I don't like the last word the KISS does fit (Keep It Simple St***d). I agree, complexity is dangerous. I also agree that we add way too many extras in our lives. I've learned this all the hard way. I didn't use to be a simple person, and I have to fight the tendency at times too. How about KISS = Keep it Simple Silly?